First you must become a Topcoder member and start competing! The competition is free but you must be a member who is 18 years or older, as well as meet all eligibility criteria, in order to participate. The 2017 Topcoder Open First2Finish Competition will take place in four (4) online stages. The top three (3) performers, per the leaderboard, of each stage from the First2Finish Competition will win a prize and/or a trip to compete in the TCO17 Finals in Buffalo, New York, USA on October 21-24, 2017. 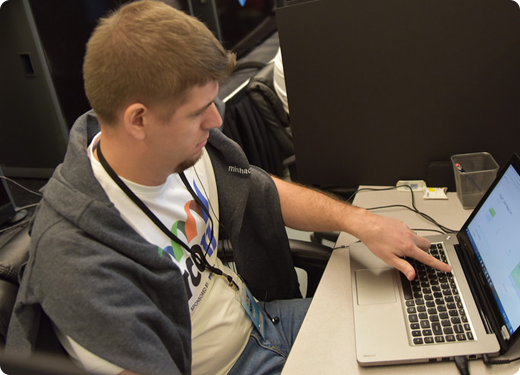 During each Stage, Contestants who participate in Tournament-eligible First2Finish Competitions on the Topcoder website will receive points for that Stage as outlined in these Rules. Only Tournament-eligible First2Finish Competitions in which registration has opened during the four (4) Stages shall be included in determining points for that Stage. All Tournament – eligible First2Finish Competitions will be clearly marked on the active challenge listing page. Scoring in the First2Finish Competition is determined based on the final ranking for a Contestant’s submission in a Tournament-eligible First2Finish Competition (as applicable) in accordance with the rules of such competition. Upon the completion of all Tournament-eligible First2Finish Competitions, the individual scores that a Contestant receives during all Stages will be added for a cumulative score. The tied Contestant with the highest number of first place submissions will receive a higher placement in the First2Finish Competition in that Stage. If a tie still remains, then the remaining tied Contestant with the highest number of second place submissions will receive a higher placement in the First2Finish Competition in that Stage. If a tie still remains, then the remaining tied Contestant with the highest number of third place submissions will receive a higher placement in the First2Finish Competition in that Stage. If a tie still remains, then the remaining tied Contestant with the highest number of fourth place submissions will receive a higher placement in the First2Finish Competition in that Stage. If a tie still remains, then all remaining tied Contestants will receive the same placement. The tied Contestant with the highest number of first place submissions across the First2Finish Competition Stage will receive a higher placement in the First2Finish Competition. If a tie still remains, then the remaining tied Contestant with the highest number of second place submissions across the First2Finish Competition Stage will receive a higher placement in the First2Finish Competition. If a tie still remains, then the remaining tied competitor with the highest number of third place submissions across the First2Finish Competition Stage will receive a higher placement in the First2Finish Competition. If a tie still remains, then the remaining tied competitor with the highest number of fourth place submissions across the First2Finish Competition Stage will receive a higher placement in the First2Finish Competition. If a tie still remains, then prizes will be divided equally between tied Contestants. Prior to Contestants receiving their cash prize, they must complete all work for all underlying First2Finish Competitions and Tournament and First2Finish Competition-related work, such as final fixes. Contestants are eligible to win only one trip to the onsite tournament regardless of the track they compete in (as long as the Final schedules do not overlap). However, contestants with more than one win across different tracks will receive $500 in lieu of each extra trip won.